was damaged by rioters, perhaps in 1956. Often I would look for 'the funny little bust of General Earle'. E M Forster mentions it in his Alexandria: A History and a Guide when he talks about the buildings round the Place Mohammed Ali, among them the Anglican Church of St Mark, built on land granted to the English by Mohammed Ali himself. 'Looking through the railings of the churchyard', writes Forster, 'is the funny little bust of General Earle (k. 1885 at Kirbekan in the Soudan). It was erected by the European Community, and represents their chief incursion into the realms of art'. 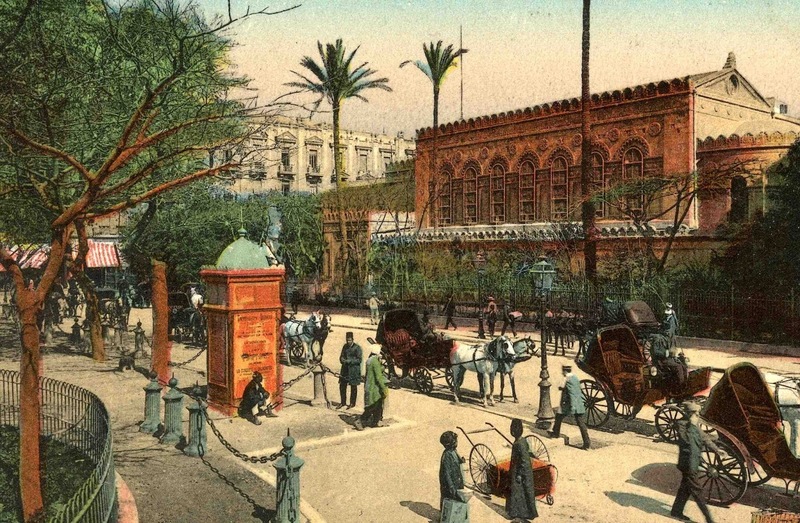 The remark is wonderful Forster, and each time I would pass the church I would walk along the railings looking for that funny little bust of that funny little man who got himself killed while trying to relieve General Gordon at the siege of Khartoum. But I never could find it. Forster also describes St Mark's church, which 'considering its date (1855), and its pseudo-Byzantine architecture, is however a tolerable building'. Forster was educated in an age when the medieval and especially the Byzantine were depreciated, and he had little appreciation of Islamic or Eastern Christian architecture. Instead he admired the Banco di Roma, 'the finest building in the city', in the Rue Cherif Pasha, 'a modified copy of the famous Palazzo Farnese, which Antonio da San Gallo and Michelangelo built in the 16th cent., at Rome' - in other words, Renaissance, which was about the most that Forster's taste could handle. St Mark's Church is a handsome and interesting building, built by James Wild who had already built the richly eclectic Christ Church, Brixton Hill, London. Of his church in Alexandria, Wild said that though it 'agrees in plan and mass with the style of art used by the early church architects, it carries out a general sentiment of Arabian detail'. St Mark's Anglican Church in Alexandria. One day in 1986 I was walking past St Mark's again and went inside where I met the vicar, so to speak, Father Howard Levett. Except that being the priest for St Mark's Alexandria, and despite having a parish of only a few score Anglican souls, Howard was in a direct line of apostolic descent from St Mark himself; he was Archdeacon of Egypt, North Africa and the Horn of Africa, a very grand title for a delightful man. 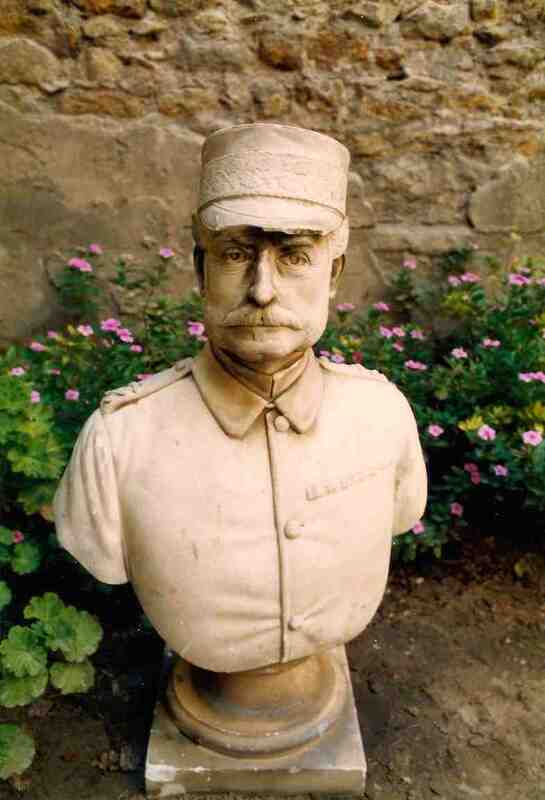 So I told Howard about Forster's funny little bust of General Earle and asked what he knew about it. He had never heard of it, Howard replied, and that was that. It seems that after I first asked about the bust of General Earle, Howard asked his gardener Mustafa if he knew anything about it. Mustafa had been gardener at the church all his life and his father had been the gardener before him. And Mustafa remembered that when he was a boy there had been a riot, it might have been 1956 but he was not sure, and the bust of General Earle that had been peering through the railings was attacked, knocking a few bits off the peak of his hat. Mustafa's father took the bust away and buried it somewhere in the church grounds and the whole business was forgotten. Maybe in a thousand years somebody would have dug up the funny little bust and wondered who he was and why he was there and what it was all about. Or maybe General Earle would have remained lost to this world forever. Instead Mustafa remembered the spot and dug the general up. But Howard was worried about restoring the bust of General Earle to its vantage point peering through the railings, reckoning there might always be another riot and the general would be attacked yet again and be forever shattered. So the bust has been put round the back of the church, just outside the vestry door. 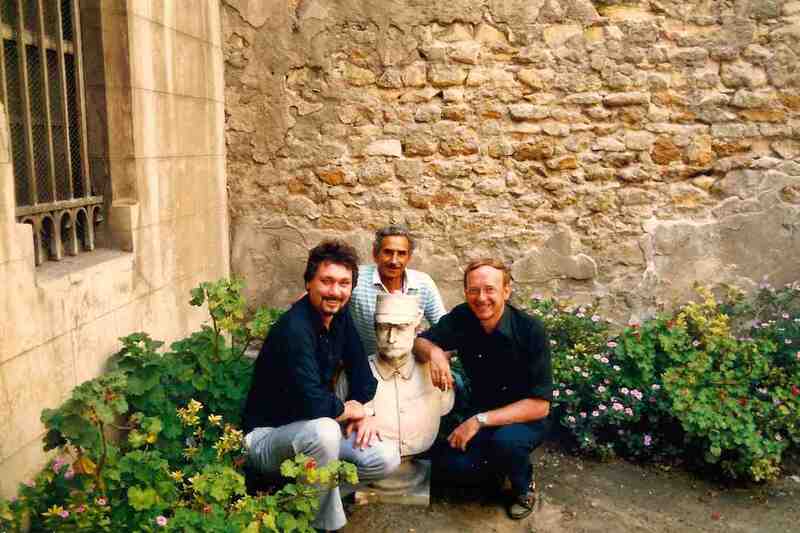 Michael Haag, Mustafa and Howard Levett in 1987 with the rediscovered bust of General William Earle behind St Mark's church. I mention this now so that the general is not forgotten. I do not know if his discovery counts as a triumph of archaeology; he was hardly buried for more than thirty years. But it was a triumph of a sort and good fun to find Forster's funny little bust. I hope the church is able to preserve General Earle, who gave his life in trying to relieve Gordon at Khartoum, from further damage or theft or from being mistaken for a garden gnome. By the way, apart from an appearance in Forster's Alexandria, General Earle also makes an appearance in Justine, the first volume of Lawrence Durrell's Alexandria Quartet. The tense night and dawn of the duck shoot on Lake Mareotis is over and Darley, who half expected to be killed for having an affair with Nessim's wife Justine instead receives a letter from her, saying she has left him, has left everyone, has left Alexandria forever. Durrell draws on Forster when he has Darley give us his reaction to the sudden news. Durrell's list closely follows Forster's itineraries, though where Forster wrote 'Rue Pirona', Durrell mistakenly transcribed it as 'Rue Piroua'.